In 1836, surveyors working for the U.S. General Land Office measured out the 6x6 mile grid of the future Town of Greenfield. Arterial roads and streets were later built at half-mile intervals following that pattern. In the days before road maps, streets were usually known by locally-used names, or given the names of streets extending out of Milwaukee to meet them. In 1930 a county-wide system of names and addresses was applied, and many streets received new designations. Cold Spring Road was an exception. Available supplies of pure water were important to past residents and remain today. 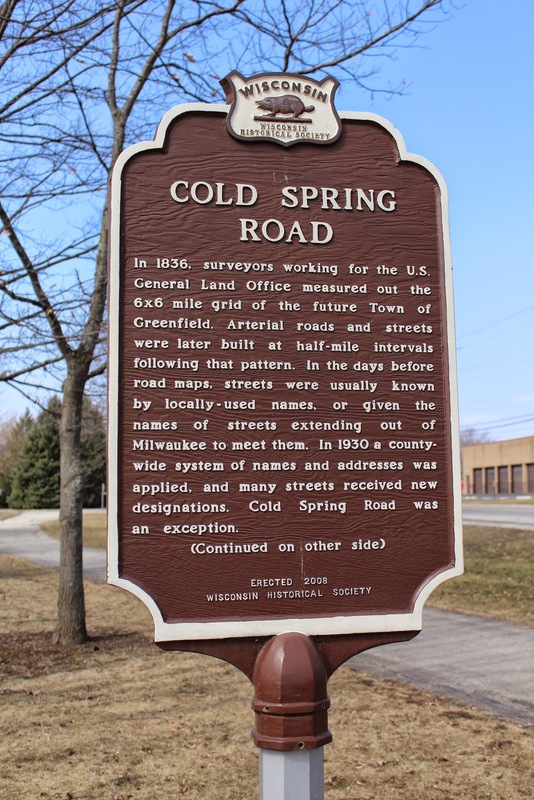 Cold Spring Road was given its name by early settlers because of the prized natural springs along its western portion. The local school district was named “Cold Spring” in 1843, and “Cold Spring Road” has its earliest mention in the will of pioneer John Finan dated 1849. Of the twenty-six roads laid out along the 1836 surveyor’s grid, it alone still bears its original name. The marker is located in Alan Kulwicki Park on Oak Leaf Trail, on eastbound Cold Spring Road, east of its intersection with South 108th Street / Wisconsin Route 100, Greenfield, Wisconsin 53228. Plenty of parking at the marker location . . .
Side two of the marker . . .
visible in the distance, left of center. The marker is located at Alan Kulwicki Park, east of this sign. First visit, January 6, 2013. What happened to the Spring? Is it still in existence? I do not know the answer to that very good question!